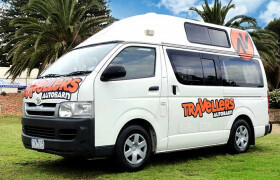 Looking for Campervans in Perth? We review 27 local campervan hire agencies. Perth, the capital of Western Australia, is an isolated city beaming with sandy coastlines, scenic parks, and historical museums. Known for its distinct location and great weather, campervan hire from Perth is such a perfect holiday treat. Hire a campervan from Perth and experience a unique and fascinating road trip you’ll never forget. 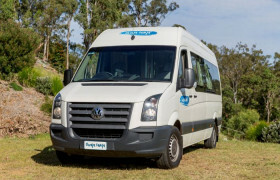 Whether you want to travel in a budget camper, a luxury 2 berth campervan or a 6 berth family motorhome, Hit The Road has got all the information you need on who's the best campervan hire company in Perth to suit your needs as well as all the essentials ideas you might want on where to go, where to stop and where to play. Nestled along the breathtaking Swan River, Perth is a secluded yet thriving city full of charms. Because of its location, it is the best starting point for your Western Australian holiday. And more often than not, it is dubbed as the sunniest city in the country, where its shades and scents of bright days glow year round. The Mediterranean climate polishes the scenic nature views and towering buildings in ways beyond imagination. Wander amongst the picturesque pathways of the elevated Kings Park and the inner-city Hyde Park. For beach lovers, take a trip down to the beach-side suburb of Cottesloe or bring your kids to the City Beach. It is also a place for art buffs and history enthusiasts with attractions like the Art Gallery of Western Australia, Amaze Miniature Park, and Aviation Heritage Museum. With the immense activities at hand, no wonder Perth continues to be one of the best holiday destinations in the country. When it comes to accommodation, Perth is loaded with some good deals. The city’s central hub is packed with different options for different budgets, ranging from aristocratic hotels to reasonable hostels. Some of these spots may be pricier, of course, because of the proximity to tourist attractions, restaurants, and shopping malls. But opting for a place near the central district means easier transportation. Still, there are cheaper choices even in the bustling city. Backpacker inns and cheap hostels sprout within the city centre to provide limitless accommodation range to everyone. 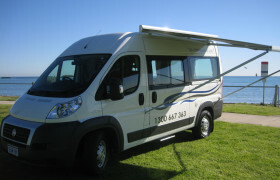 And for those wanting to get a hold a unique Perth holiday, a campervan hire in Perth is a sound and solid choice. Campervans are top choices when it comes to exploring the vibrant natural parks and pearly beaches. And if you’ve decided to rent a campervan or motorhome of your choice, there’s an extensive array of campgrounds and parks near the city. Here are some of the best picks that are worth the mention. Discover Perth’s breathtaking beauty by engaging in some fascinating annual celebrations. After all, Perth is more than just an isolated Western Australia city―it binds different festivals and events to create a distinct Perth personality. A yearly multi-arts event from February to March, the Perth International Arts Festival defines art in a different hue through music, film, opera, circus, and more. On the southern part, the Margaret River Gourmet Escape (November) and CinefestOZ (August-September) are another premier festivals for food and wine enthusiasts and filmophile. And just within the central district is the Kings Park Festival, where the wildflowers are in full, beautiful display every September. As the biggest city in Western Australia, Perth boasts of gastronomic finds that reflect the distinct culture of the region. Fringed in awe-inspiring settings, there’s plenty of ground to explore for first-time travellers and even constant vacationers. A perfect feature about the city is that it curates and presents a variety of flavors but does not overpowers the authentic Australian dining. In Perth, wine is an award-winning pair for any food selection. Fall in love with a glass or two at Bivouac Canteen & Bar or at Must Wine Bar. For a hint of a casual and fine dining experience, there’s the Il Lido, Balthazar, C Restaurant, and The Standard. The Greenhouse lives up to its name, featuring eco-friendly exteriors and healthy food options. And if you’re on tight budget, some best cheap eats are offered in Old Lane Street Eats, Neighborhood Pizza, Piggy Food Co., and Francoforte Spaghetti Bar. 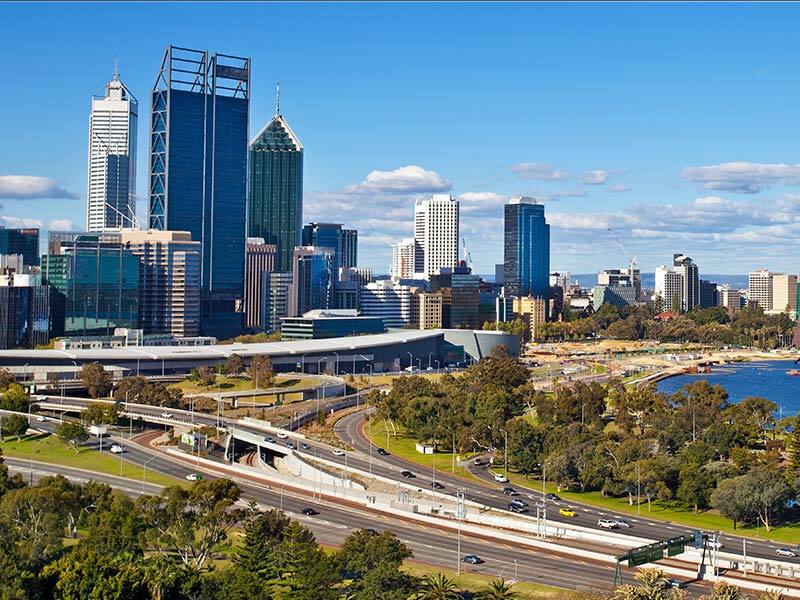 Being listed as one of the most remote capital cities in the world, Perth’s distance to other Australian capitals is quite an enigma. It is even closer to East Timor and Jakarta, Indonesia, geographically speaking. The distance to the next capital city, which is Adelaide, is 2,104 km away, and will take more than a day of driving! There are lots of deserts in between the other capitals, and because of its far-flung location, it can be likened to an island. The isolation, however, posts plenty of reasons to love Perth even more! This road less travelled certainly holds a charm to every traveller. 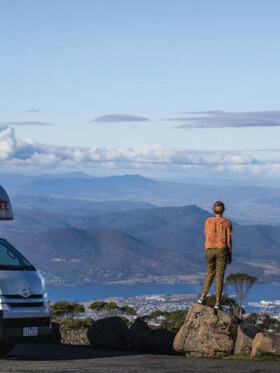 From scenic road trips to tasty food and wine to calming weather―there’s no better way to discover the city and its beauty than hiring a campervan or motorhome. It’s high time to explore what’s in store in this isolated Western Australia city. Surprisingly, its isolation becomes an instant travel inspiration. Well, Perth is rather big, providing a plethora of attractions to choose from. Compared to other Australian cities, Perth exudes that laid-back aura with a hint of adventurous vibes. The temperature, not to mention, is very lovable! From Perth, the best place to start exploring the outback is from Ellis Brook Valley Reserve, then to Mundaring State Forest, down to neighboring forests like Jarrahdale, Youraling, and Dwellingup. Camp at Lane Pool Reserve, which is packed with outdoor activities like hiking, biking, boating, and fishing. A famed wine region in the south is the Margaret River, which also offers the best weekend beach escape. Surfers swarm to get a dose of vitamin sea and conquer some big waves. Tour a winery and relish some truffles, cheese, and chocolate. The panoramic views of Moore River and Gnangara Pines outline the northern area. Further north, the endless stretches of vast sands sprinkled with limestone pillars and diverse wildflowers sweep the Pinnacles Desert. All these remarkable natural assets are suitable for anyone looking for a relaxing and at the same time exciting holiday. Within the metropolitan, you will be surprised by the limitless attractions that live in unison. The great sunshine makes it perfect for a sparkling river cruise. Witness from afar the city skyline and other towering buildings that mark the economic growth of Perth. The urban setting features some historical traces like the Perth Mint, Perth Cultural Centre, and the Swan Bell Tower―all make up for the city’s cultural confidence. Also along the metropolitan is a wide variety of restaurants, bars, and cafés, together with flagship stores, premium boutiques, and local stalls. Uncover more of the Western natural beauty and cultural charms with a road companion―a campervan, sleeper van, motorhome or a 4WD. Without a doubt, exploring this remote yet surprisingly bountiful city is best done at your own pace. So, here’s an easy-peasy, eight-day itinerary that will cover some of the best places to visit in and around Perth. This round trip can be extended to 2 weeks so that you can add in extra trips and fully immerse yourself with the locals, the culture, and the city. Pick up your campervan or motorhome from its designated depot in the city. If you arrive in the morning, then you can embark on an epic road trip before lunch. From Perth, head south to Busselton, which is around 2.3 hours via State Route 2 and National Route 1 going to Bussell Highway. Witness the world’s longest wooden jettyㅡthe Busselton Jetty, and book a ride on the electric jetty train that is open up to 4 PM. You might get lucky and see some adorable giants! After a long drive and a unique train ride, take a dip in the soothing waters of Geographe Bay and bask along its sandy coastlines. Outdoor sports are also in play like windsurfing, diving, and fishing. Less than an hours ride via Caves Rd and Cape Naturaliste Rd is the awe-inspiring Leeuwin-Naturaliste National Park. 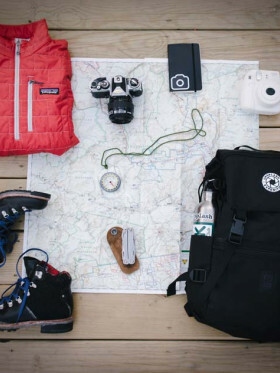 The park stretches more than 120 km, so better prepare your hiking essentials. Beneath the vibrant and flourishing heath-masked headlands lie some fascinating limestone caves and tunnels embellished with crystals, flowstone, stalactites, stalagmites, and fossils. Bushwalking is a popular activity, just like surfing, fishing, and birdwatching. Amidst the vast ocean views and spectacular rock formations, the Sugarloaf Rock stands out in magnificence, which is a nesting site of Red-tailed Tropicbirds. Everyone deserves a mouthwatering treat at some of best restaurants in the area, including Bunkers Beach House, Eagle Bay Brewing Co, Wise, and Leeuwin Estate. One day in Margaret River is clearly not enough. After a jam-packed day, make your way to some of the best campsites and cabins in the region to prepare for a fun-filled day tomorrow. Wine at the beach, anyone? Margaret River is reputably known as the best Australian wine region perfectly skirted with an immaculate coastline. A trip to Margaret River would never be complete without, of course, a wine tour! The region is dubbed to be one of the finest wine producers in the world, so a bit of wine tasting is just perfect. The restaurant at Vasse Felix consistently offers the best food and wine options for everyone. Feast on an array of chocolate, cheese, and craft beers stores in the area. Take a quick breakfast inside your campervan before hitting the road. Break up your trip before Pemberton and stop to see the centuries-old fossils in Mammoth Cave and gigantic chambers in Jewel Cave. Then, hop on to Milyeannup National Park, which is an hour ride. Though not that popular, the park is such a hidden gem, especially for those driving a 4WD. There you will discover some unspoilt beaches and impressive flora and fauna. If you’re renting a campervan, you can head straight to Greater Beedelup National Park, a more well-known spot for a personal and up-close encounter with nature. Great hiking trails, including water abundance, are speckled around the vicinity. Soothe your muscles in the calming Beedelup Falls and enjoy an alfresco dining in the area. If you want more nature encounters, there’s Warren National Park and Gloucester National Park, both known for some breathtaking karri trees and outdoor activities like canoeing, kayaking, and tree climbing. Campground options in Pemberton may be limited. These are the two best options on hand. From the south, it’s time to pack up the campervan and head north and go back to the Perth via Albany Hwy/State Route 30. The trip would be quite long, roughly 4 to 6 hours. Fret not because there are lots of attraction along the way. Break up the journey and begin with Mount Barker and its famed pies and tasty wines. Further north, you’ll pass by the dreamy town of Konjunop. Stopover at Kojonup Reserve brimmed with bushland and bird life. Another hour ride will take you to the historical town of Williams, which is one of the oldest settlements in the Western region. Now that you’re back in the capital city, it’s best that you wander around the top attractions conveniently scattered near the metropolitan. Relax at Kings Park and Botanic Garden or take a romantic cruise on the Swan River. Then, live over the city’s historical mining prominence at Perth Mint and have a close encounter with wild animals at the Perth Zoo. And 30 minutes south of Perth is the port city of Fremantle. Visit popular tourist spots, including Fremantle Prison, The Roundhouse, Fremantle Arts Centre, Western Australian Maritime Museum, The Shipwreck Galleries, and Fremantle Markets. On your last road-tripping day, best that you stay within Perth and not linger anywhere. Just like most companies, rental hours are strictly followed. Dine out so that there’s no need to wash the dishes! 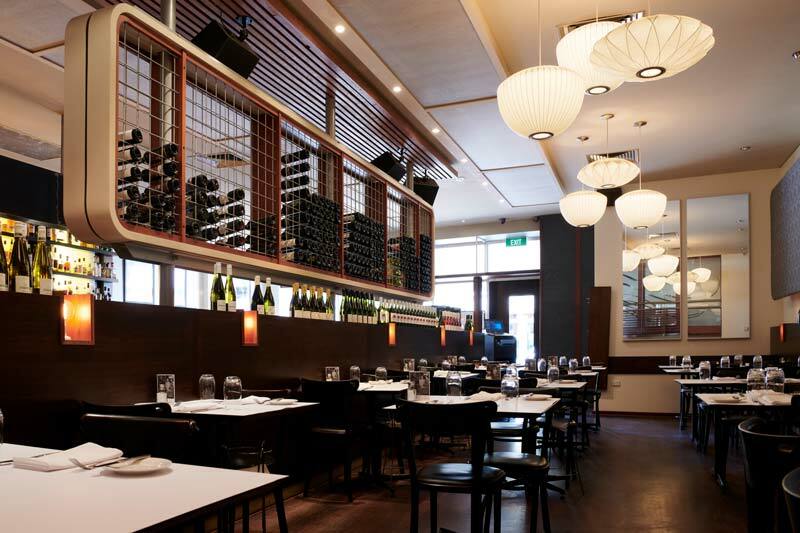 Have a hearty and delicious meal at one of Perth top-rated restaurants like Bivouac Canteen & Bar, Il Lido Italian Canteen, and George Street Quarters. And before returning the unit to the depot, check everything and make sure that you clean it unless you want to pay a cleaning fee. There are some rental companies that allow drop-offs at the airport. Just verify with the company upon booking. Now, head back home and prepare for another one for the books road trip. Are you ready? 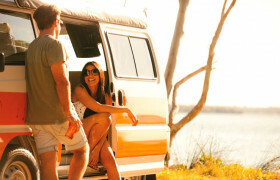 Travelling from one attraction to another in Perth is such an easy task, especially if you’re renting a campervan. Most tourists spots within the city are even accessible by foot, but best if you have a vehicle to beat limited hours. TransPerth is the region’s public transport system that includes train, bus, and ferry networks. Do take note that Perth is an isolated city, so it would be quite difficult to access other Australian capitals by car but still possible. Ideally, if you want utmost comfort while getting off the fancy tourist trail, the best way is to hire a campervan. Fully-equipped 4WDs are also highly recommended if you’ve got a thing for off the beaten tracks. Characterised by hot, dry summers and temperate, rainy winters, Perth is such a likeable tourist destination. Because of its Mediterranean climate, it is often tagged as Australia’s sunniest capital city. The city is blessed with warm days and cooler nights, especially from March to May (autumn) and September to November (spring). Because of a higher rate of warm weather year round, outdoor lifestyle is way popular. 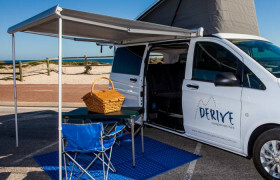 Considering that Perth is a rather secluded city on the western side of Australia, it’s quite a charm that campervan rental opportunities are abundant. But of course, compared to other capital cities, one-way rentals might not be that popular. Still, you get plenty of options to choose from, including Britz Campervans, Jucy Campers, Let’s Go Motorhomes, Apollo Campervan Hire and Star RV, Travellers Autobarn, and more. There’s also a great deal of 4WD hires in the city, which is suitable for those with a heart for adventure. 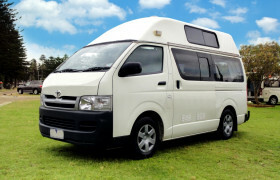 Hit The Road offers affordable rentals from small to well-known campervan rentals in Perth. If you rent a campervan from Perth, then there are few things to take into account before conquering the unknown. Exploring any Australian city must be accompanied with preparation and patience or else your road-trip holiday could turn out into a lemon. Pick the campervan of your choice and book way in advance. Consider some extras being offered by the company like free airport shuttle services, cooking and kitchen essentials, and outdoor equipment before hiring a unit. Befriend your campervan. Driving in Australia means driving on the left side of the road. Most of the vehicles feature a steering wheel on the right side. So, practice diligently if it’s your first time. Check the campervan thoroughly and take note of prior defects, if any. This will surely save your soul in case of unjustifiable charges. Opt for soft bags rather than hard suitcases for a roomier interior space. Shop for supplies after picking up your camper so that you’ll not miss out anything. On your first night, make sure that you plug in your campervan to ensure that all facilities and appliances are working. Avoid travelling at night, especially through the outback, if you don’t want to encounter wandering wild animals like kangaroos, cows, camel, rabbits, dingos, and wallabies. 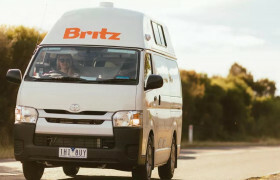 Britz is no doubt one of the most popular campervan options, not just in Perth but in the whole country. They may not be the cheapest but this 5-star campervan hire with big company support can easily book out in peak periods due to high demand. Among other Britz locations, the Perth branch at 471 Great Eastern Hwy Redcliffe, 6104 is the largest and is conveniently accessible near the airport. The branch comes with a spacious lounge and facilities like a drink machine and luggage storage. Their fleet is extensive with backpacker campervans, family motorhomes, and 4WDs options. Pick-up and drop-off must be done by 3:30 pm. 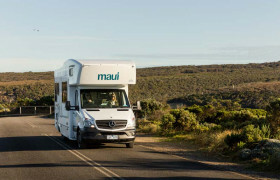 As part of the rental tycoon, Britz, Maui is the high-end hire of the business, offering a fleet of brand new campervans and motorhomes. These luxury models are only run by the company for a maximum of 2 years, then they pass it on to their sister companies. They share the same depot with Britz and Mighty, which is at 471 Great Eastern Hwy Redcliffe, 6104. As the elite category, their campervan range features an apartment-style accommodation. They have lots of units of offer but may still book out in peak periods despite not being the cheapest campervan option. 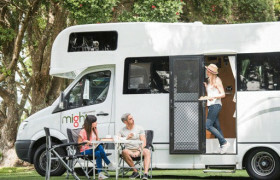 Mighty is the budget brand of Britz, where youth travellers gather to hire one of their budget campers. These models are the worn out vehicles used by Maui and Britz after 3 years or so. But don’t be discouraged with the term ‘worn out’ because all these models are highly maintained. They’re cheap and flexible so that you can see the laid-back and fun side of Perth. Their depot in the city is the same as the other two companies above-mentioned. Lucky concentrates on the budget group, with one of its 3 depots located in Perth. 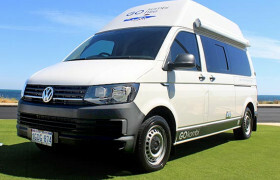 Heavily linked with a renowned rental mogul, the company sources out their fleet of 2 to 4 berth campervans from Jucy. If you’re on tight budget, their units may just be the cheapest campervan hire around. These models, of course, have some wear and tear features but are still great on the Western Australia roads. They are located at 110 Francis St, Perth WA 6003, Australia, and opens from 9:00 am to 4:30 pm. 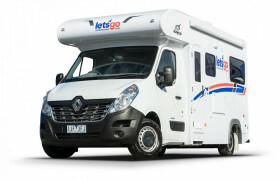 When it comes to luxury rentals, Let’s Go Motorhomes continues to be one of the top contenders in Perth. They offer a range of new 2 to 6 berth motorhomes every month―all Jayco units stocked with all essentials and some extras. With a consistent brand new fleet, their rates might be pricier compared to other rental companies. But of course, you’ll get a younger campervan with close to zero wear and tear issues. They have nine depots all over the country, with Perth branch located at 56 Murray Rd North, Welshpool WA 6106 and pick-up and drop-off hours from 8:00 am to 3:00 pm. Featuring 10 depots, Apollo has created a name in the rental industry in Australia. They even have branches in the USA and New Zealand. Their branch in Perth is situated at 65 Worrell Ave, High Wycombe WA 6057, Australia, with branch hours from 8:00 am to 4:30 pm, Monday to Sunday. Just like all other Apollo locations, the depot in Perth is consist of modern campervans and motorhomes, with a maximum age of 3 years. Surprisingly, the company holds a hit-or-miss reputation from customers despite their popularity. Still, they make sure to provide a range of high-quality motorhomes that fit couples and families. Part of the Apollo group, Cheapa Campa holds a similar fleet and same depot location at 65 Worrell Ave, High Wycombe, WA 6057. From their name itself, they focus on cheaper rentals, well, because of the age of the vehicles. These units are the worn out units of the Apollo brand that are still reliable on the road. Being a popular rental company, plus their cheaper rates, they easily book out during peak season. 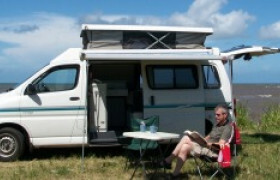 Real Value is known for their much affordable rates and lots of campervan options. They offer a discounted campervan price because they do not own their vehicles and they do not shoulder the maintenance cost. Having a third-party source like Cheapa Campa, which is part of the Apollo brand, they provide cheaper rates than the owner company. Also, you pick-up and drop-off the unit at the Apollo Perth depot in High Wycombe. A family-operated campervan rental with a drop-off depot in 333 Great Eastern Hwy, Redcliffe WA Australia, Kangaroo Campervans rents out a range of older Toyota and Ford units. These units accommodate couples, starting families, and larger groups. Aside from their depot, the company allows airport service to add-up to their reputation of personalized service and affordable rental rates. This award-winning campervan rental in Australia has six depots in Australia, and one is in Perth at 6 Adrian Street, Welshpool, WA 6106. They are open Monday to Friday, from 9:00 am to 5:00 pm and Saturday: 9:00 am to 1:00 pm. Travellers Autobarn operates a wide range of 2-5 berth campervans, cars, and motorhomes, most of which are targeted at the budget market. 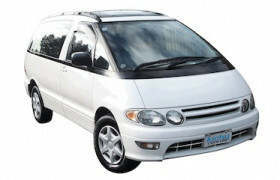 Distinctively, they are one of the few campervan hires in the country that allows rentals to 18-21 years old clients. 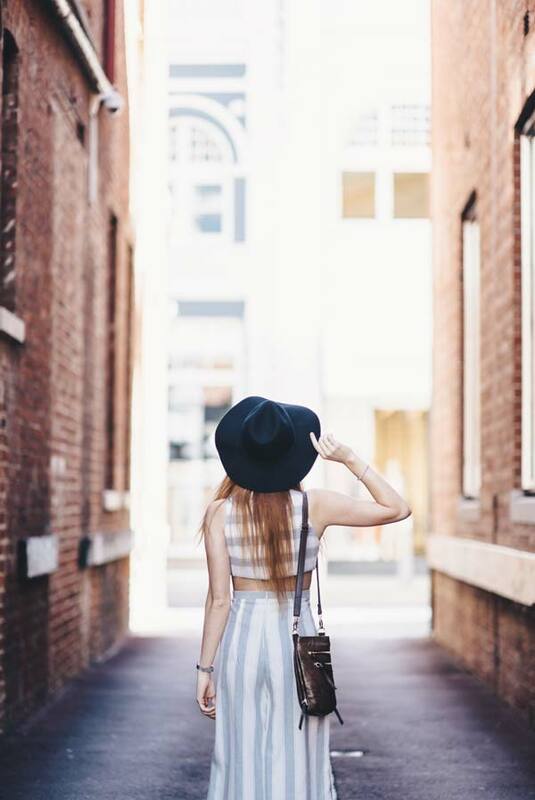 When visiting Perth, there’s surely something that will fit every type of traveller一whether it’s about natural escapades, historical adventures, or dining feats. If you love all of the above, then renting a campervan is such a splendid idea. The Australian Outback is perfectly featured with the city’s isolation, and nothing is more fitting than to take the unknown route at your own pace. For added convenience and unforgettable Perth adventure, the easy and convenient itineraries below are just a manna from heaven. Once you’ve chosen your own kind of adventure, rent a unit from the array of options from Hit The Road, ranging from campervans to motorhomes and station wagons to 4WDs. An epic road trip, however, entails lots of preparation. You can’t just go on a campervan journey without knowing, at least, the slightest idea about the place you’re going. Preparation is the key, really! The pre-set itineraries, attractions, events, and other important information below will have you fueled up in no time. Further, you can find info related to campsites, caravan parks, local rest areas, and dump stations for your Perth campervan rental. Know more about Perth and be ready to have a road trip of a lifetime. Ever dreamed of a laid-back holiday with a hint of adventure, at your own pace and convenience? 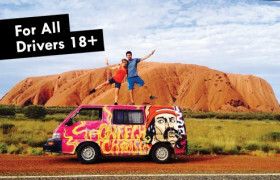 Well, you might just be fulfilling such dream in no time with a campervan hire from Perth. Campervan rental in Perth is a highly recommended way to witness and experience the greatness (also vastness!) of Western Australia. Factor in a sturdy camper and take note of some of the most epic WA road trips. From Perth, head north to the seaside beauty of Exmouth. Serving up some scenic water views and terrestrial charms, you get to experience a more in-depth encounter with nature. Take in the mesmerizing woodlands and wildflower landscapes, then slow down the pace as you enter the Kalbarri National Park. Feast on a platter of rock lobsters from Geraldton and prawns from Exmouth. And for the ultimate northern WA adventure, swim and be one with underwater creatures like whale sharks, turtles, and manta rays. Albany holds a million-dollar charm being one of the oldest towns in the country. Steeped in historical elegance, go on a bygone journey as you visit shipwrecks, heritage sites, Anzac memorials, and whaling station. Don’t miss the famed Natural Bridge in Torndirrup National Park, which was formed by the power of the Great Southern Ocean. Via Muir Hwy/State Route 102, head west and take in the breathtaking natural features of Mount Lindesay National Park, Lake Muir State Park, and Blackwood State Forest. Take a road trip across the Nullarbor Plain and witness how spectacular beaches, engaging wildlife, and natural spectacles sprout before the epic journey to nothing. The southern beauty is known for its longest, flattest, and straightest stretch― the Eyre Highway. So, if you want extreme freedom and space with some dash of surprises, drive and enjoy what the in-betweens from Perth to Nullarbor has to offer. For an other-worldly adventure, take your feet to the idyllic expanse of yellow sand dunes and giant rock spires of the Pinnacles. The desert is uniquely situated in the naturally abundant Nambung National Park, where the blue vistas at Hangover Bay and Kangaroo Bay and the heathland of wildflowers peak in magnificence. What’s not to love with this western gem? Aside from scenic landscapes and fascinating history, Perth is the home to some spectacular events and attractions. Whether you’re on a short trip or month-long holiday, you will never get bored with loads of options on offer. 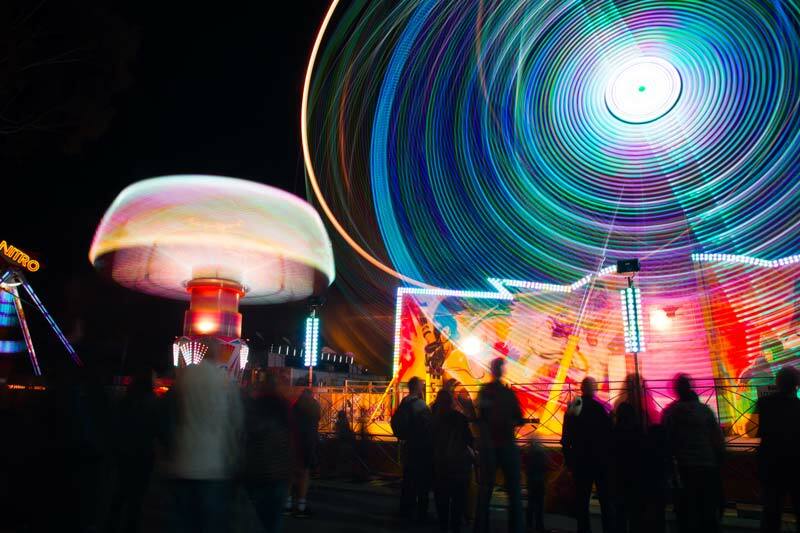 From Perth Makers Market to Comedy at the Craft and East Fremantle's George Street Festival to Perth International Arts Festival, the city is brimming all year round. The Kings Park Festival is also one of the most anticipated events every year. As the longest running arts festival in the country, the Perth International Arts Festival is charged with everything for all ages. From theatre performances to musical concerts, visitors from all over the world gather in anticipation to witness art in a unique way. At this time of the year, the city becomes Western Australia’s art playground. 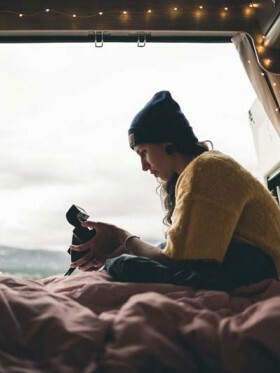 Since the event is a three-week long celebration, the best way to enjoy every bit and piece of the festival is to rent a camper that would satisfy all the happenings from mid-February to early March. The month of September is the time of the year where breathtaking wildflowers and awe-inspiring floral display flock the city grounds. The Kings Park Festival is always a favorite among festival-goers looking for some springtime color coupled with floral exhibits, live entertainment, artworks, and food options. Just south of Perth, the Margaret River Gourmet combines artistry and gastronomic pleasures into one setting. The festival is held every November and continues to be a tradition among food and wine enthusiasts. Eat, drink, party, and explore the Gourmet Village filled with a plethora of appetizing local dishes and mouthwatering wines. Interactive stations are all over the place for the crowd of food and wine loving visitors. Another fave for people who want to experience the local atmosphere and the Western Australian charm, Perth Makers Market is where ‘Perth and Handmade Meet’. Gathering the best handmade makers in the city, witness and enjoy the abundant selection of crafts, food, and drinks. With the picturesque Margaret River as the backdrop, CinefestOZ has become a must-attend activity among many film lovers and foodies. This premiere film festival in the South West showcases an interesting line-up of films every year. There are over a hundred screenings and other film-related events to fuel up everyone. Combined with the scenic setting and fascinating activities, prepare for a fun-filled weekend with your family and friends who got a flair for films (and food!). City Wine is all set every June to celebrate the best boutique wineries in the region. Go wine hopping and enjoy the amazing array of tasty wines, craft beers, and local delicacies. Plus, the live music in the Entertainment lounge adds up to the amusing crowd and overlooking skyline. Perth is a budding city that continues to surprise travellers in a rather unconventional way. Framed with wonderful weather and laid-back aura, the city has become a classic favorite for those wanting to get away from the busy and crowded eastern side. 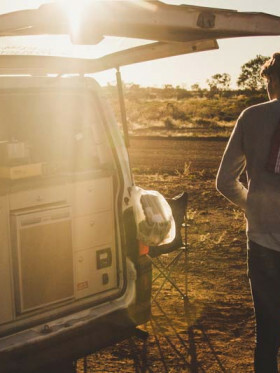 Go on a campervan hire to experience first-hand the stunning beaches, tasty food and wine options, and outback adventures. Here are some of the must-try activities while you explore this hidden gem in Western Australia. A panoramic Swan River cruise is the perfect starting activity for your holiday. Discover some scenic sights along your trip, plus a complimentary visit to a winery. En route from Perth to Fremantle, you will pass some beautiful structures standing tall the cityscape. There are lots of cruise tours in the city, normally a 2.5-hour trip. If you want more of the calming waters, then take a hike or bike along the riverbank and enjoy the rewarding feat of nature. Let’s not forget that Perth and its surrounding towns are known for their world-class wines. So, satisfy your wine thirst and go wine hopping. Several wine tours are being offered in Swan Valley and Margaret River, which are dubbed to be the wine regions of the West. Some of these tours are coupled with the Swan River cruise for a full day trip. Showcasing some of the finest wines in the country, you also get to enjoy a selection of beer, cider, cheese, and chocolate. With its stunning location, Kings Park offers the best views of the city’s skyline. The park is very huge, hence the name, and is considered to be one of the largest indoor parks in the world. Slow down your pace and wander around the scenic pathways and gardens. Go on a picnic with your partner while the kids have the time of their lives at the playgrounds. For your tummy needs, there a kiosk provided, along with the Fraser’s Restaurant and Botanical Cafe. Fremantle oozes with historical charms that are worth the visit. A 30-minute travel south will take you to the aesthetic port city of Fremantle, whose 19th-century beauty is still evident after many generations. Plenty of cafes, shopping centres, and bars, on the other hand, loom out for a modern touch. Because of such combination, it’s like you are in both worlds in one place. Revisit the interesting maritime history and feast like a local in one of the seafood restaurants along the harbor. Don’t forget to visit the ancient Fremantle Prison, the largest convict-built prison in the country, and the Roundhouse, the oldest structure still standing the Western Australia region. 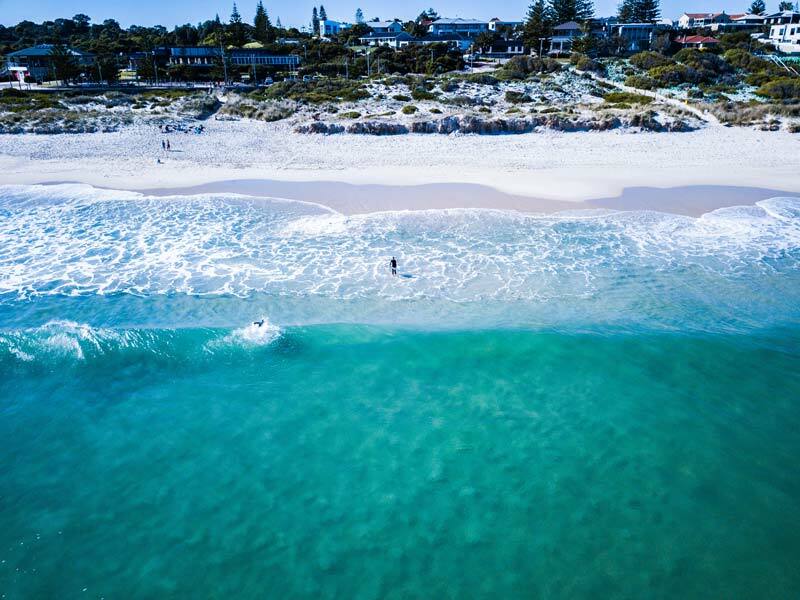 For many decades now, Cottesloe continues to be a Perth favorite when it comes to beautiful shades of blue, immaculate sands, and relaxing atmosphere. The beach is such a famed spot for locals wanting to take a break from the city life and travellers looking for an on-point sea destination. Just a 20 to 30-minute ride from the central business district, the place is a popular spot for outdoor recreations like snorkeling, surfing, and kitesurfing. Relax under the warmth of the daylight and watch as the sun goes down to its horizon. Conveniently, there are cafes and restaurants scattered nearby. Every March, the expansive beach stretch turns into a mesmerizing sculpture park with the annual Cottesloe Sculpture by the Sea. But of course, natural parks offer the best Western Australia views. With a campervan, you can easily and smoothly hop on from one park to another at your own convenience. Plus, you get all the comforts of home while conquering the western side. The John Forrest National Park is the closest park you can choose for some great walking trails and waterfalls. If you’re an underwater lover, then the Marmion Marine Park and the Atlantis Marine Park are the top choices. If it’s high time to prepare for your Western Australia road-trip, then you must have incorporated all the itineraries, including events and activities in your plan. (If you still haven’t, then take a peek at the Plan Your Trip tab and see the tips and insights needed for your Perth adventure.) But aside from these, you must be equipped with some practical info for a hassle-free road trip. From recommended campsites to dump stations and gas stations to shopping centres, all of these are gathered in one to make your Perth holiday the best trip of your life. 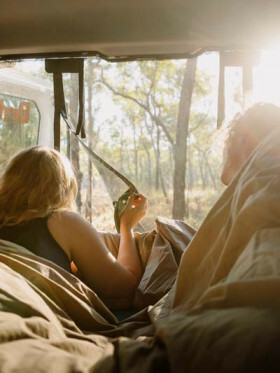 So, plan and take the tips below for a memorable adventure - but remember the best thing about being in a hired campervan is that you can CHANGE IT any time. The hotel accommodation in Perth might not be the perfect option for those who want extreme freedom. Freedom means travelling at your own pace without the need to go back and forth to your hotel. Plus, staying in a hotel can be technically pricier, with hidden transportation fees and more. Travel smart and know the best campsites and caravan parks to park a campervan in. Strategically located near the airport, city centre, and Swan Valley, Central Caravan Park is the go-to park for locals and travellers alike. The place is loaded with cabins and glamping tents for everyone on-board. Powered sites are all over the place for your campervan, trailer, and motorhome needs and are priced from $48 to $108. Within the park, there’s a swimming pool, fully-equipped camper kitchen, and laundromat. Discovery Parks are some of the popular caravan parks in the city. The Swan Valley branch is one of their highly recommended options for those who want something near the city attractions. Families will enjoy the range of facilities on offer such as pedal karts, movie room, games room, playground, and pool. There are large storage sites for you campervan as well as large power sites for power and water options. Unpowered sites rates are $30, while powered ones are $35. The park is also suitable for people with disability. This large tourist park situated in Perth's northern suburbs is great for a weekend road trip. Karrinyup Waters Resort has been in the industry for many decades now, and they have consistently been one of the top tourist parks in the western region. Take a dip in the gigantic pool, warm pool or hot spa. Let the kids have fun with the jumping pillow and the playground. Three separate dump points, two laundries, and two camp kitchens are provided. A great place if you have gone for a larger motorhome rather than a smaller campervan. Site rates start from $45 per night. The Fremantle Village is a great accommodation village and caravan park near Perth, with its location just a 30-minute ride from the city centre. It is the only option if you want to stay within the grounds of Fremantle using your campervan. Since Fremantle is a famed port city, you get to enjoy nearby seafood restaurants, and of course, the calming beach atmosphere. Offering ensuite powered suites, ensuite cabins, powered sites, and drive-thru powered sites, the place provides accommodation to large vehicles and vans. Daily rates vary for different site types, usually from $38 to $104. But good thing, pets are permitted at the sites. 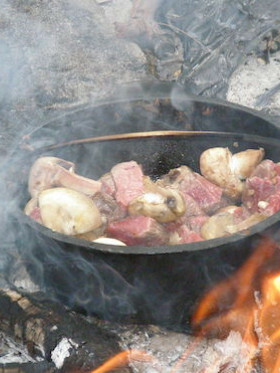 If you run out of fresh linen, you can rent from them and even use their camp kitchen. If you want to stay in Margaret River, then first on the list would be the BIG4 Taunton Farm Holiday Park Margaret River. This farm-theme destination is a recommended base to enjoy the wine region of the south. There are different self-contained cottages for different types of travellers, some of which are wheelchair accessible. Also, there’s a wide array of sites, ranging from large powered sites to medium reverse in sites and small powered sites to unpowered ones. Plenty of selection for the campervan. Daily rate starts at $45 for powered sites and $42 for unpowered. Featuring a number of accommodations for different types of budget, Wintersun Caravan and Tourist Park also offers facilities for extra convenience like camper kitchen, kiosk, laundry, car wash, dumping station, swimming pool, and more. Their shady, grass powered sites are suitable for a family of 6, plus some pets. Daily rates range from $43 to $59. Nestled along the picturesque Middleton beach, the holiday park is a premier destination in Albany. Loaded with various accommodation options and different caravan and campervan sites, you get to relax in style and utmost comfort. The camp kitchen, BBQ area, and other facilities are easily accessible near the sites. Daily rates start at $43. Just minutes away from Perth, Mandurah Caravan & Tourist Park is a well-commended option for couples, families, and even large groups looking for a nearby park. Their shady sites suit all types of budgets. 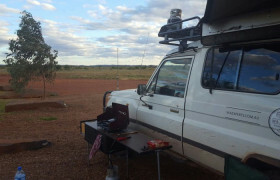 They have deluxe ensuite powered sites, powered campervan sites, and grass sites, ranging from $33 to $82, depending on the number of persons and the rented site. And at $33 for an unpowered site, it is a bargain if you are looking to park the campervan cheaply. Coalmine Beach Holiday Park lies at the southern side, fringed with five spectacular National parks and the nearby body of water, the Nornalup Inlet. With its natural bushland backdrop, the place is the perfect destination for those who appreciate nature at its finest. Their campsites that accommodate up to 6 people are divided into powered and unpowered, with prices from $34.50 per night. This scenic beach resort in Busselton is packed with an array of choices for everyone, from one to three bedrooms, all of which are self-contained. Aside from the built-in accommodation, they have powered campervan and camping sites featuring 4.5-star resort facilities. Both ensuite sites and powered sites cater to up to 6 people and priced from $43 per night. With the breathtaking Yallingup Beach as the background, this holiday park is armed with striking beach views, lighthouses, walking trails, wineries and more. The park is equipped with self-contained cabins, grassed caravan, and campervan & camping sites. Van and tent sites are estimated to be $32 per night during offseason and could go up to $54 come peak periods. This pet-friendly park is recommended for those en route to the north. Ledge Point Holiday Park welcomes travellers with their selection of cabins, chalets, small powered sites, and unpowered sites. These sites are great for your campervan, trailers, motorhomes, and even large tents. Prices run from $27 for unpowered and $32 for powered sites. Midland Tourist Park is situated on the edge of the Swan Valley and nearby Perth’s many tourist spots. Their excellent location is coupled with a number of accommodation options that are decently priced. 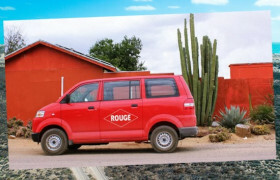 On top of their en-suite rooms and self-contained chalets, they have drive-thru tourist sites at $45/ night and tourist campervan sites with power at $35/ night. Whilst most campervan hires appear to be all glitz and glamour, you can never miss the fact that each unit also needs cleaning. Let’s be practical, getting rid of your RV waste is an essential aspect of every campervan rental. Conveniently, there are plenty of campervan and camping sites in and near Perth that offers dump stations for you to empty your tanks. Some may require certain fees if you utilize their disposal stations because these are mostly located in tourist parks and resorts. 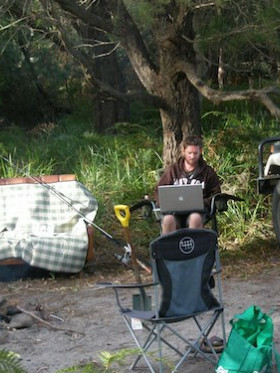 Here’s a list of dump stations for your campervan and motorhome needs. 186 Hale Road Perth: Just at the city centre, this one is easily accessible before you drop-off your unit to its designated depot. 2-16 Kingsway, Madeley: Located within the scenic Kings Park, the place is a great option for those who want easy access to other tourist attractions. 6 Toodyay Rd, Middle Swan: If you’re looking for a dump station near the Swan Valley, then the one from Midland Tourist Park is recommended. 91 Benara Road Caversham: This dump station is one of the facilities being offered by popular Discovery Parks- Swan Valley. 467 North Beach Road Perth: Situated in Karrinyup, you can make use of this site along your drive south. 34 Central Avenue Redcliffe: Central Caravan Park not only offers cabins, glamping tents, and powered sites but also a dump station. 44 Station Road Margaret River: For those who are exploring the small yet fascinating town of Margaret River, this one is a nice option. 8 - 10 Willmott Avenue: Another dumping station in Margaret River is the one provided by Riverview Tourist Park. 22 Wellington Street Albany: Located within the BIG4 Albany Gardens Holiday Park ground, this site works well with those camping on the southern area. 550 Albany Highway Albany: Stationed along the Albany highway, the place is the most convenient station to use if you’re on your way back to Perth. Whether you are renting a budget campervan or a family motorhome, sometimes you need to take breaks every now and then to recharge. It could be tempting to just park your campervan on the side of the road and stop driving. Still, be a responsible driver and traveller. So, if you need to regain your lost energy, there are plenty of rest areas dispersed all throughout Western Australia. Pull off the highway for a while and take a decent rest at one of these convenient and comfortable sites in the region. 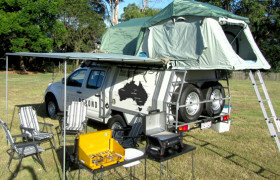 Go on your way with the WA Experts' range of 4WD campervans or 'Troopies'. 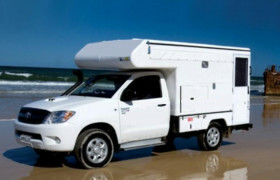 Troopies are built to access Australia’s remote areas in the most convenient way. For a combination of luxury and fun, Derive Campervan Hire has what it takes to give you the best of both worlds. Located in Canning Vale, Perth, this small Australian owned and operated company rents out 4 berth Mercedes Benz campervans without shower and toilet.